‘Research Fingerprinting’ is a new development on the Research Professional platform that delivers highly relevant funding opportunities to researchers. 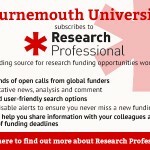 Using advanced, highly-targeted algorithms, in combination with their extensive industry knowledge and refined discipline taxonomy, Research Fingerprinting generates personal funding alerts for the majority of the researchers at our institution, based on publicly available information about your research interests and published work. Once deployed, fingerprinting will perfectly match our researchers with their research interests and help deliver the most relevant funding opportunities into your inbox every week. You will be able to edit your fingerprint if you find that the some of the disciplines do not match your research interests. You will already have alerts set up and so when this is switched on, you will receive two alerts on a Friday. You can compare these to see which is finding the most relelvant funding opportunities. This should be the Fingerprint and so you can then remove your previous selected alerts. The fingerprint will update as your research interests grow. This post is to let you know that Research Fingerprints is coming soon. It is now available for the majority of academics but we have yet to switch it on. We will be rolling this out shortly and will notify you via another blog post.